Videos which have been viewed hundreds of thousands of times on Facebook and YouTube, and published by mainstream media in both India and Pakistan, show military jets flying at night and dropping what appear to be bombs. They went viral as India claimed Tuesday it had launched an air strike which killed a large number of militants in Pakistan, a claim which Islamabad has denied and which sent tensions soaring between the nuclear-armed arch-rivals. Indian social media posts and television channels claim the videos show Indian fighter jets carrying out strikes in Pakistan; Pakistani Facebook posts and newspapers say the footage shows Pakistani jets chasing Indian military planes out of their airspace. All the claims are false; the videos are actually from a 2014 demonstration by the Pakistani Air Force for Independence Day celebrations in Islamabad. The first misleading video shows what appears to be an F-16 jet flying through the night sky and firing what could be bombs or flares into the darkness. Pakistani's mainstream Urdu-language newspaper, Nawa-i-Waqt, posted the video on its Facebook page, where it had been viewed more than 17,000 times in the six hours since it was published. The post's caption says: "Immediate and timely flights by Pakistan air force planes. Indian planes ran away: DG ISPR". "DG ISPR" stands for Director General Inter Services Public Relations, or Pakistan's military spokesman. The same video was posted on an Indian Facebook account alongside claims it showed the Indian Air Force bombing "terror camps". The video has been posted repeatedly on Facebook in both countries. A second video which was posted on Pakistani Facebook page SiasiTV, where it has been viewed more than 20,000 times in the two hours since it was published, contains similar footage of a warplane flying at night. The caption on the post claims it shows the Pakistani air force responding to the Indian incursion. The exact same footage was also posted by an Indian Facebook account, where it has been viewed 36,000 times in the five hours since it was published. The caption says: "Indian Airforce Attacks Pakistan". An Indian regional television channel from Gujarat, Morbi News, also posted the footage on their YouTube channel. A YouTube search found both videos shared in all the misleading posts actually show a 2014 air show to mark Pakistan's independence day. An August 12, 2014 statement by Pakistan Air Force announces the night flying demonstration for the next night, August 13, 2014. It says: "Two formations of PAF fighter jets will participate in the fly past during the Independence Day ceremony being held at Islamabad. The two formations of 04 F-16s and 04 Mirages combat aircraft are already undertaking fly past rehearsals. To mark this auspicious occasion the fighter jets will also release illuminating flares during night fly past between 13 and 14 August night." The videos show the night fly past when the fighter jets released flares. The first video used in the misleading posts was originally published on YouTube on August 14, 2014, and is headlined "Pakistan Air Force F-16 Block 52+ dispensing Flares" (1). The second video used in the misleading posts shows the same 2014 night flight demonstration from a different angle. This footage was posted on YouTube on September 23, 2016 with a headline: "Pakistan Airforce Islamabad night flying" (2). Tensions have soared over Kashmir since a February 14 attack which killed more than 40 Indian paramilitaries, and was claimed by a Pakistan-based militant group. In that time social media in both countries have seen a flood of fake videos and photos. 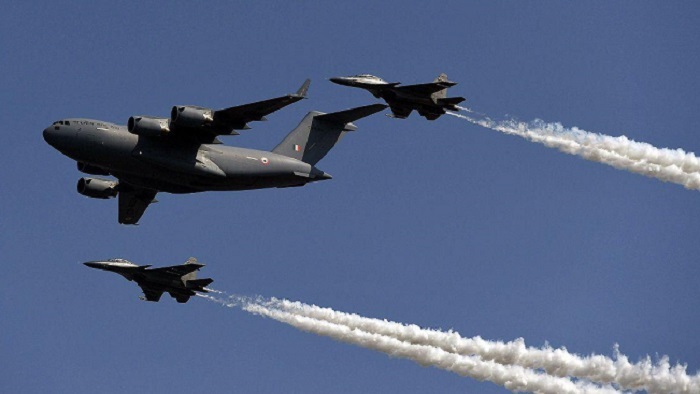 India's military has said its jets carried out air strikes on February 26, 2019, hitting militant camps in retaliation for the suicide attack. Pakistan's military rejects that account and says that after Indian planes intruded into its airspace, it scrambled jets and chased the Indian planes out, saying they dropped their payload harmlessly in Pakistani territory while fleeing. The suggestion that the two viral videos in question here are linked to Tuesday's incursion is false; the videos are from 2014.